For most nonprofits, Facebook and Twitter have become the social media outreach centers, as MySpace faded fast under the weight of cybervandalism, spam, malware, and other unsavory content. 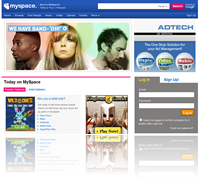 Clearly, it's too early to count MySpace down and out. It’s really about who you are through the things you’re into... around entertainment and content and how you present yourself. For us, it is a relationship of trust. Will all of this be enough to bring users back to MySpace? And, if so, will your nonprofit be there? Facebook's requirement that you have a mobile verification in order to log in is preventing me from accessing my account with them. Once I'm able to log back in (if that ever happens) I'm gonna delete my account. I'm done with those control freaks. So long as Myspace doesn't pull the same stunt that Facebook did I'll keep my account with them. I like Myspace's format better anyhow.